In most recipes for apple desserts, breads and coffee cakes you will be instructed to use cooking apples or “dessert apples”. Somewhere back in our history of apples a difference was made between eating apples and cooking apples. An eating apple is supposed to be the sweeter one and the cooking less sweet or even sour. I have never fit into a “common” mold and this is also true in the case of apples. The sour apple or green apples which are designated for apple desserts use to be one of my favorites for eating. When I was young I would grab the salt shaker and a sour apple and begin eating one of my most enjoyable snacks. I still get the ‘cringes” when thinking about that sour salty taste that was so heavenly. As I have often said, the best apple pie that I ever ate was made with quartered McIntosh apples; these are designated as eating apples. There are some bland mealy apples like the Rome Beauty which didn’t seem to fit in for desserts so by the process of elimination were simply pushed into the “eating apple” category. In actuality these are great apples to bake. They hold their shape and when adding a little lemon juice and spices like cinnamon and nutmeg the apple flavor becomes enhanced and delicious. 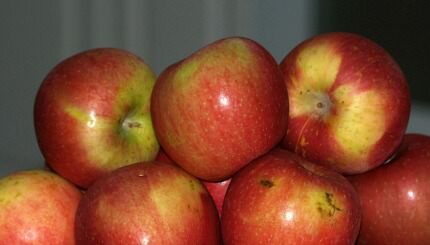 The high fiber content of these apples makes them worth keeping them in your list of choices. Much of your choices of this great fruit for apple desserts depend on an individual preference of the finished recipe. For instance, do you like your applesauce soft and mushy or like me a little on the chunky side? Do you like your apple pie pieces to be thin soft and melting together with the use of regular pie apples; as I said I love the large quarters of baked apples in the pie. I just want to encourage you to try the different types of this fruit for your desserts. Just because one might be called an “eating apple does not mean you cannot use it in your favorite dessert. Learn as much as you can about all the apples available to you; experiment and decide for yourself. 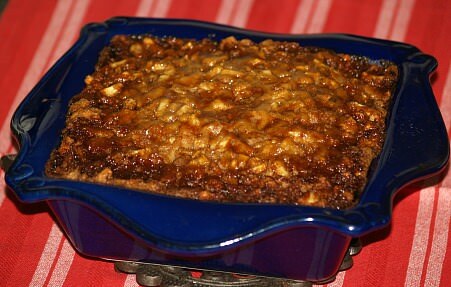 This baked rice pudding recipe is a favorite old time dessert; not only is it a healthier dessert but also delicious. Stir together in bowl egg yolks, apples, cooked rice, butter and vanilla. Beat egg whites until stiff peaks form; fold egg whites into apple mixture. Turn mixture into 1 ½ quart soufflé baking dish; set dish in larger pan. Set both pans on rack in oven; pour boiling water into larger pan to 1 inch in depth. Bake for 70 to 75 minutes; serve warm or chilled. This is one of the desserts which is cherished from many years ago. This simple Missouri pudding was a favorite of Mrs. Harry Truman during World War II. Beat eggs and sugar together until creamy. Stir in the nuts, apples and vanilla. Pour batter into greased 9 inch square baking pan; bake 35 minutes at 350F degrees. This tapioca recipe is another old apple recipe. Tapioca is good with many different fruits and one that my mother used to make. Toss apples with sugar, cinnamon, salt and tapioca until evenly coated. Place apples in 2 quart baking dish; pour lemon juice over apples. Add boiling water to baking dish; cover and bake for 1 hour at 300F degrees. 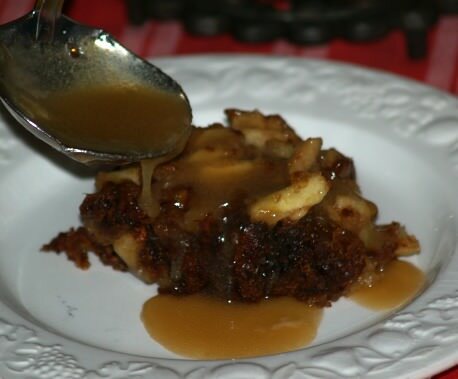 This is another old apple dessert recipe; this one with a delicious sauce. Cream sugar, butter and egg together. Sift flour and dry ingredients. Add apples and nut to dry ingredients; stir dry ingredients into creamed mixture. Mixture will be very dry; spoon into greased 9 inch square baking pan. Bake for 50 to 60 minutes; to serve spoon sauce over top. Heat in medium saucepan butter, half and half and sugars over medium heat. Stir until sugars are dissolved and mixture has thickened a little. Stir in vanilla; let cool to warm and serve over apple dessert.